Doodling is a great way for children and adults to practice artistic techniques. No only do they provide practice with lines, shapes, color and value, but are great for experimenting with mixed media such as colored pencils, markers, highlighters and water colors. 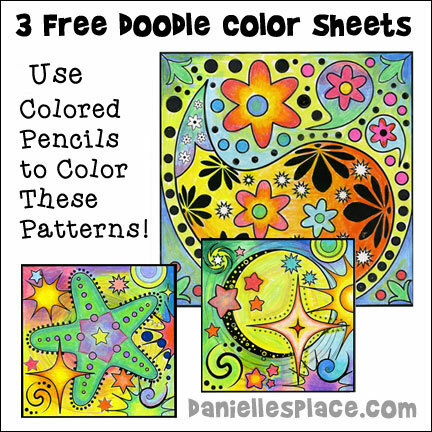 A good way to learn how to doodle is to print out some doodle patterns and color them. 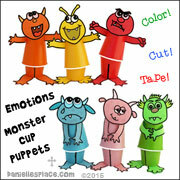 Add some of your own doodles to the pictures and then try making your own doodle art from scratch. We recommend using Prismacolor Premier Colored Pencil because they have very soft lead, provide a large variety of deep colors or soft colors depending on how hard you press. They are also great for blending and shading. 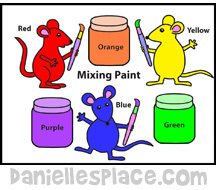 Three white mice have fun learning about mixing colors. Watch "Mouse Paint" on Youtube.com or read the Book to your children. 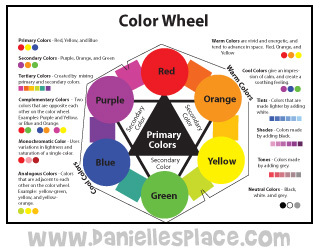 Review the following terms and have your children point them out on the color wheel. Primary Colors - red, yellow and blue. Secondary Colors - purple, orange, and green. Tertiary Colors - The six colors created by mixing the primary and secondary colors that are next to each other on the color wheel. Complementary Colors - Two colors that are opposite each other on the color wheel. Monochromatic Colors - Are variations in lightness and saturation of a single color. Analogous Colors - Colors that are adjacent to each other on the color wheel. For example, yellow-green, yellow, and yellow-orange. Warm Colors - are vivid and energetic, and then to advance in space. Colors with red, orange, and yellow are warm colors. Cool Colors - are calm and soothing. Colors that include glue, green and purple are cool colors. Tints - are colors that are made lighter by adding white. Shades - are colors made by adding black. Tones - are colors made by adding grey. Little White Owl lives all alone in the snow, but he doesn't mind so much because his head is filled with happy stories. One day he decides that it is time to go see the world, and he discovers a place that is occupied by beautiful colorful owls, owls just like him, or so he thinks. When he tries to be friendly with them they are standoffish and tell him he doesn't belong with them because he doesn't have any colors. 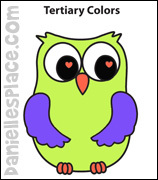 Little Owl disagrees and says, "But I do have colors . . . here in my heart! . . . I'll share them with you if you want?" Though the colorful owls were reluctant to listen to them at first, they find that they enjoy Little White Owl's stories and ask for more. 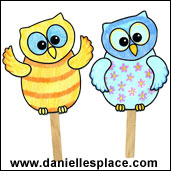 When it is time to go home the pretty owls ask to come with him, and the Little White Owl leads them to his home. They become good friends and promise to visit each other often. Have your children look at the pictures of the Little White Owl in his white world at the beginning of the story. Ask them what colors they see and how the colors make them feel. 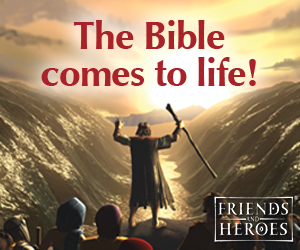 Then have them look at the picture of his magical stories. Ask them what colors they see and how the picture makes them feel. Using the Color Wheel Printout to review primary, secondary, tertiary, and analogous colors. Ask your children what their favorite colors are, and if they choose items of this color when they have the opportunity. Ask them why they like the color and what they own that is that color. Ask your children if they would like their whole house and everything in the house to be their favorite color. Read the story about Purple Little Bird. When you are done ask your children what Purple Little Bird might have learned. Say that Purple Little Bird learns that too much of a good thing can be bad, and that moderation can be a good thing in life and in the colors we choose. You can also point out that variety can be interesting and exciting. If everyone and everything was the same, life would be boring. 4. Learn what Monochromatic means and study monochromatic works of art. Monochromatic - Having only one color, represented by differing hues and tints. Study artists who used monochromatic color schemes. Follow the links below. After your children have studied the images, ask them what they think about them. Then show them works by the same artist that aren't monochromatic, and ask them how they feel about them. Compare the different works or art. 1. Print out the crayon box pattern onto card stock. (Available to members.) If you are not a member, you can use library card pockets instead. They are a little shorter, but you can cut the crafts sticks shorter to match the envelopes. 2. 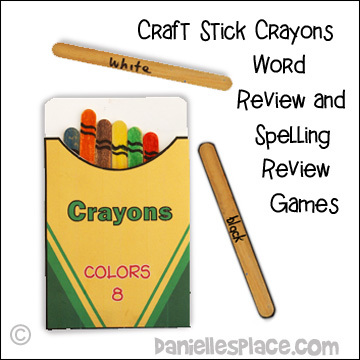 Have your children color the craft sticks different colors and then write the name of the corresponding color on the back of the craft stick. 2. Have your child say the name of the color and try to spell it, and then turn the crayon over to see if he is correct. 3. If he is correct, he can place the crayon back in the box. 4. Have your child keep playing until all the crayons are in the box, and he can spell all the words. 1. Remove all the crayons from the box and turn them over so that the words are showing. 2. Have your child read a word on one of the crayons, and then turn the crayon over to see if he is correct. 3. If he is correct, have him place the crayon in the box. 4. Have your child keep playing until all the crayons are in the box, and he can read all the words. Spice up your painting experience! A great alternative to traditional paint media, spice paint introduces children to alternative methods of painting, promotes experimentation and creativity. Make this an even better home school learning activity by including the history and origins of spices. Include a geography lesson by looking the countries from which your spices came. 1. Write a number on each egg cup in the egg carton. 2. Measure out one teaspoon of a spice and place it in one of the egg cups. Write the name of the spice and the number of the egg cup on a sheet of paper. This will help you remember which spice is which. 3. Add a teaspoon of water to the spice in the egg cup and mix it up with a paint brush. 4. 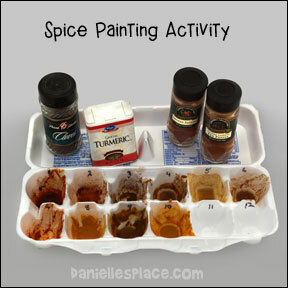 When the spice is thoroughly mixed, paint a small patch of color next to the name of the spice. Do this for all the spices you use. 5. After your paint swatches have dried decide what you would like to paint using your new paints. Learn More About Spices - Spices come from all over the world and are made from many different things such as herbs, tree bark, roots, rhizomes, and a combination of different spices. Print out the List of Spices with information on where they come from and what they are made from. If you are using a spice that is not on the list, look it up on the Internet. Look up the countries of origin on a map. 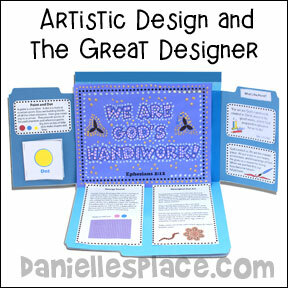 Use this craft to introduce your children to color theory. Red-Yellow-Blue: Colors in Art This is a great book about color and how it has been used in art through the centuries. It contains hand-ons experiments, tests, introduction to famous artists, artistic techniques and color theory.